As I search for ways to teach how to grow food in winter (and/or indoors), I happened on a slim volume called “MicroGreenGarden: Indoor grower’s guide to gourmet greens,” by Mark Mathew Braunstein (Book Publishing Company – Green Press Initiative, 2013). Braunstein carefully and clearly sets out the advantage of microgreens and how to start and grow them. I was inspired! 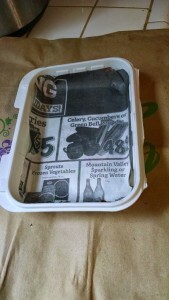 On Friday (11/21) I scavenged a couple of take-out boxes from Olive Garden that my son brought home (filled with food). They are good plastic (recyclable) and sturdy. Following Braunstein’s directions, I cut the top and bottom apart. The top became a stabilizing addition when added underneath the bottom part. Since I didn’t have an ice pick (which he recommended using), I found a large eye-screw and made 9 drainage holes in the bottoms of the stacked tray. Then I found some newspaper (he recommends sturdier paper, but I hated to use good copy paper) to put in the bottom of the tray so that the starting medium doesn’t clog the drain holes. Next step in the process was to mix starting medium/potting mix with water to make it mushy and put it into the tray. I found some seeds for sprouting languishing in my refrigerator (an organic mix of alfalfa, radish and broccoli) and measured out 1 tsp. of the seeds (per his formula on page 40). 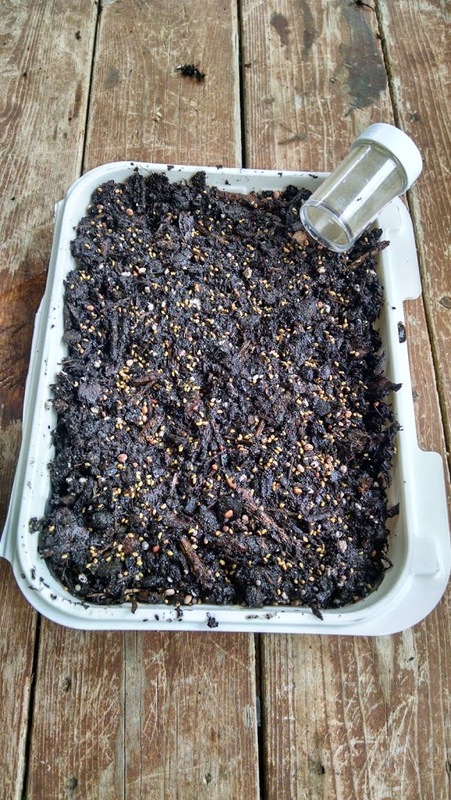 I used a small camping salt/pepper shaker to sow the seeds evenly across the top of the wet potting mix in the tray. That’s a lot of seeds for the tray – I probably only used ¾ tsp. 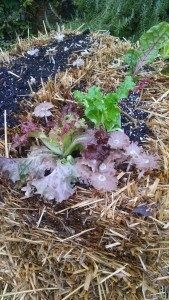 and threw the rest into one of my garden containers among the greens that are growing nicely. Then I pressed the seeds into the mix (not covering them!) with my fingers to make contact with the moist soil. 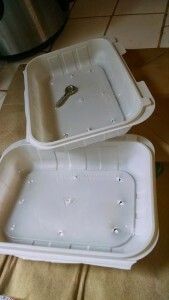 I found a larger container without holes in which to put the planted tray. Braunstein recommends covering the seeded tray with a wet cloth or paper towel until the seeds sprout. I put the tray in my upstairs study by a west-facing window (it gets somewhat warm from sun during the day) and covered with a wet paper towel. 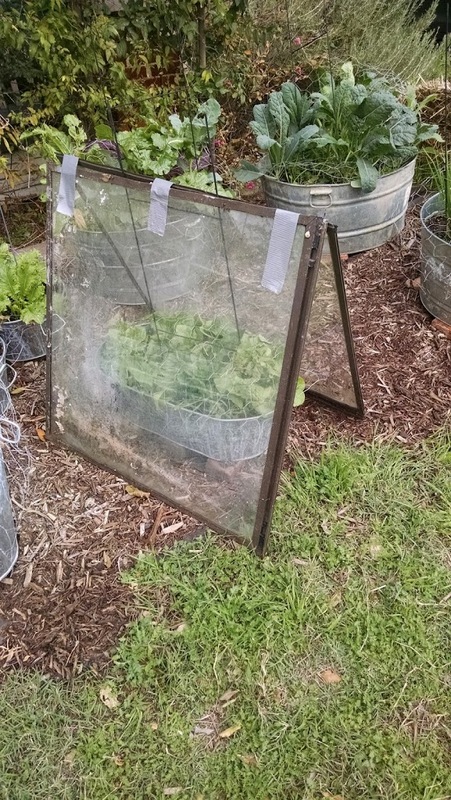 An alternative would be to leave the trays uncovered but mist or spray them three times a day. Well, I wouldn’t be able to do that, so I opted for the paper cover. 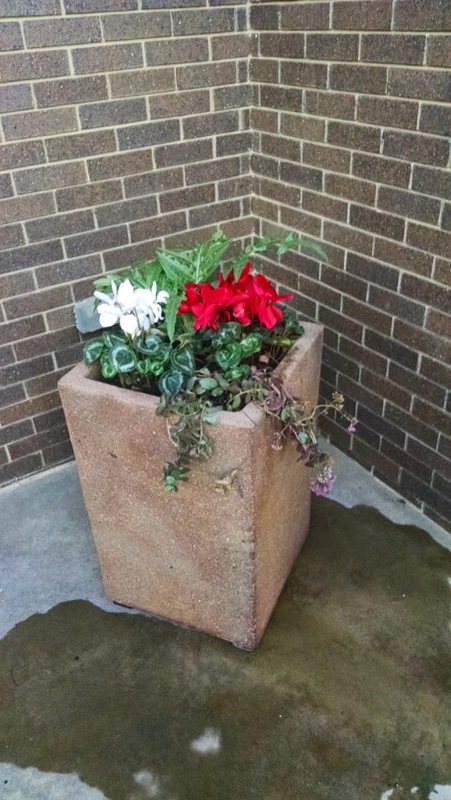 From here, I bottom water about once a day (for my smaller, ½ pint container – every other day for a pint container), or when the top of the soil feels dry. Now to watch for the sprouts. Posted in microgreens, winter greens. As I write this Sunday evening, snow is drifting down…and sticking on my lawn and on my garden plants. I have no fear that the chard will survive – it’s truly the wonder green. I had a chard plant I kept going for two and a half years! 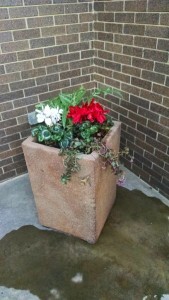 I finally took it out, because I wanted to plant something else there. 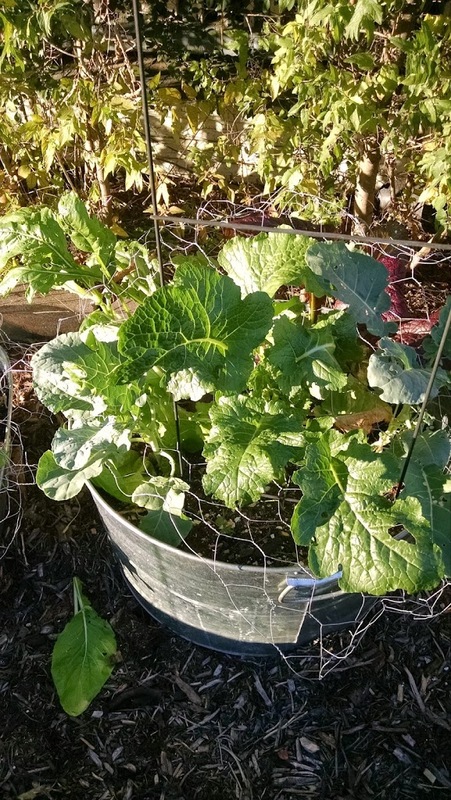 Chard will freeze, wilt and spring back with watering. But the mustard? How will it fare? I have both green and red mustard. I’m sure the kale will make it. 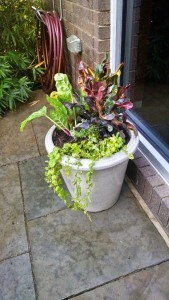 Might just water it again tomorrow – deep watering – to give it some warmth. 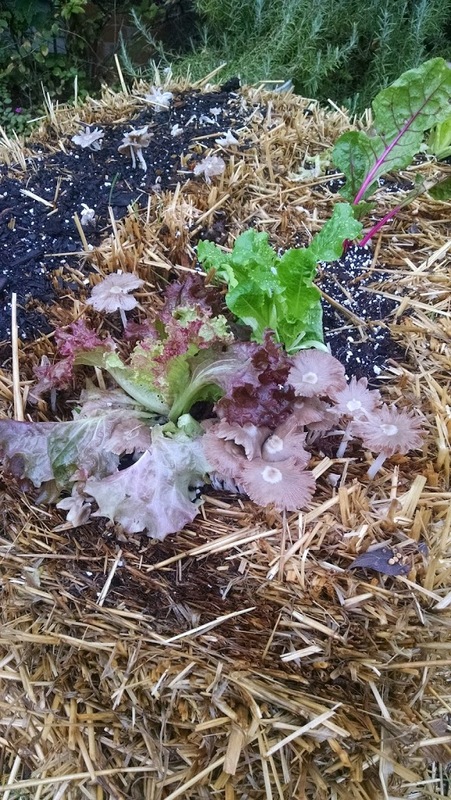 And the lettuce under the window A-frame is missing out on the snow. That can be good and bad. Snow can insulate a plant from deeper freezes. But the ad hoc greenhouse may be just enough to keep the plants alive. This is an experiment! I tell anyone learning to garden – don’t be afraid to experiment! That’s what it’s all about! Try something new. Try a new plant. Try it in a new place or plant it in a new way. You’ll have some failures. 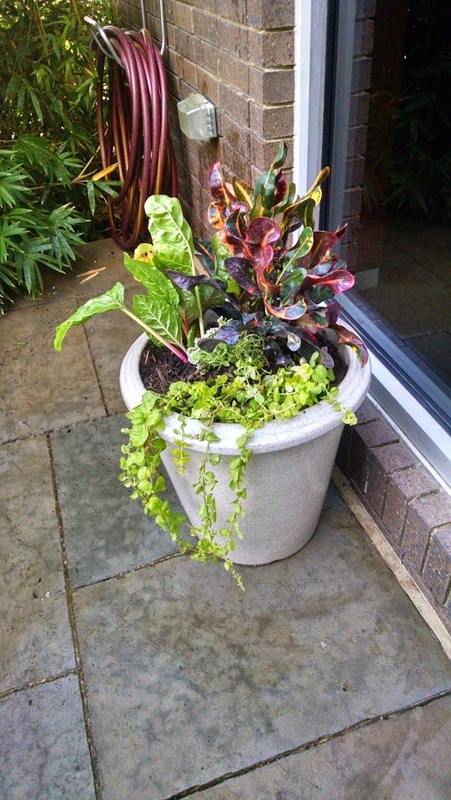 But you’ll also have some surprising successes – like my chard plant. I’ll write more tomorrow – and may even take a picture or two to show how my garden did/did not survive the early snow. 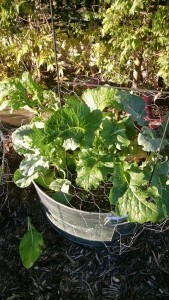 Posted in chard, kale, mustard, snow, winter plantings. About three weeks ago, I moved six hens into the backyard coop. You’ve met the hens before…in previous posts… but in a different setting. Now, they reside with me and I can sit on my back step with my tea and commune with them in the morning. A dear friend helped me with the move, which required some planning. First, we had to pick a night we were both available and then find two pet carriers. A flashlight and headlamp completed the equipment list. Hens should be moved at night – they are sleepy and so it is less traumatic for them. We avoided lights, wondering if at any moment we might be questioned by law enforcement about why we were slinking about with flashlights hen-napping. But, with a few squawks we managed to get all six hens transferred from their roost in the old coop and into the two carriers and loaded in my van. A short drive to my house and the carriers were moved into position. I had planned on putting the carriers in the run and then opening the doors to let the hens wander out. But, alas and alack … the door to the run was too narrow! Therefore, after positioning each carrier at the door, I reached in and plucked each hen out, then placed her on the shelf above the watering/feeding station. The shelf was the spot of choice because the coop framed out in the shed was not quite complete. But, with a tarp over the end of the run, it was snug and cozy and the hens slept there for a few nights quite happily. In the morning, I went out the back door, to find the hens clucking, scratching and pecking in their normal manner. 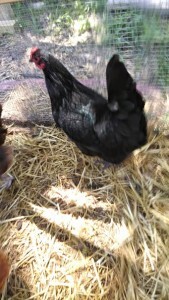 At least five of them….the sixth, Mavriki the black Australorp, was squawking and pacing about the run, checking the perimeter and otherwise fussing. She seemed to be saying, “Doesn’t anyone else notice that this place is different? Doesn’t anyone know we’re not where we were? !” No one else seemed to care. By the next morning they had convinced her it was okay, even if it was different. The hens are now settled in and, with molting nearly complete two of the hens are laying again. But wait eagerly for the green, blue and pink eggs to be gifted again by Winnie, Aurie and Rosie, the three Ameraucanas. Posted in backyard chickens, chickens, moving hens.